​it can be laid out flat and rested upon. Since the back serves as the central axis of our body, it is very sensitive. Both the upper and lower body is affected by backaches, and therefore requires regular care. Backaches may be caused from excessive workouts or incorrect postures, for example. 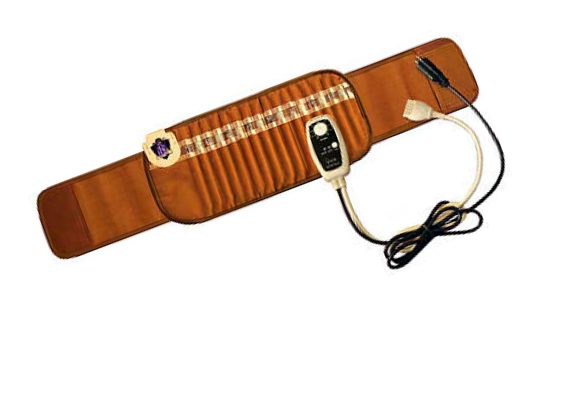 By controlling such extreme workouts, treating harmful postures, and regularly using far-infrared energy on the back, the backaches can rapidly reduce. Dilating the blood vessels of the muscles. ​ This process increases the flow of oxygen and nutrients to the muscles, helping to heal the damaged tissue. The BioBelt may be placed on the back, abdomen, waist, knees, shoulders, or other parts of the body, to focus infrared healing. Avoid placing the BioBelt on the head. This very soft and comforting process is very soothing to the body. This is a GENTLE feeling. Not harsh. Placing the BioBelt around the waist can pleasantly warm the whole body. Use this while sitting in your office chair, watching TV, or working on the computer. The 6 foot long cord allows you to move around. The gemstones Tourmaline and Amethyst are known to emit negative ions. ​including evaporating water, ocean surf, and around waterfalls. The BioBelt produces far infrared rays, which are invisible waves of heat that have the ability to permeate deep into the body. These rays gently raise the surface temperature of the body, which is believed to enhance body functions on multiple levels. 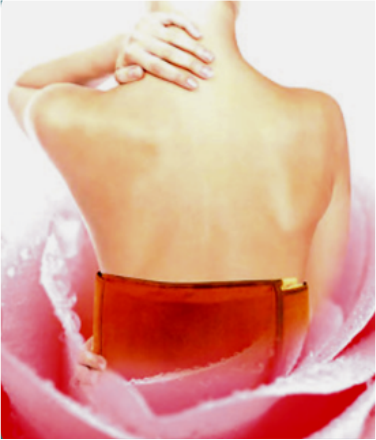 There have been numerous studies identifying the benefits of far infrared. therapy improves cardiac function and clinical symptoms in those with Chronic Heart Failure. Gemstones have been used for their therapeutic effects for thousands of years. Ancient documents have been found in Asia and the Middle East describing their traditional & medicinal uses. Only in recent times has science recognized the power that these stones can harness. Modern watches, computers, lasers and televisions all use them. So we see that crystals have been associated with the generation, transmission and storage of energy. We have carefully selected the most effective semi-precious stones to enhance the power of the BioBelt. The far infrared energy generated from these stones will gently penetrate your body providing warmth and comfort. ​The stones used in the BioBelt are Amethyst, Tourmaline, Green Jade, Crystal, Citrine, Topaz, Tiger's Eye, and Elvan. obtained by applying infrared energy to the lower backs of patients with chronic, intractable low back pain. When the BioBelt is turned on, you will feel the gentle heat of the Far Infrared Rays. This heat helps to relieve your body of its aches and pains. 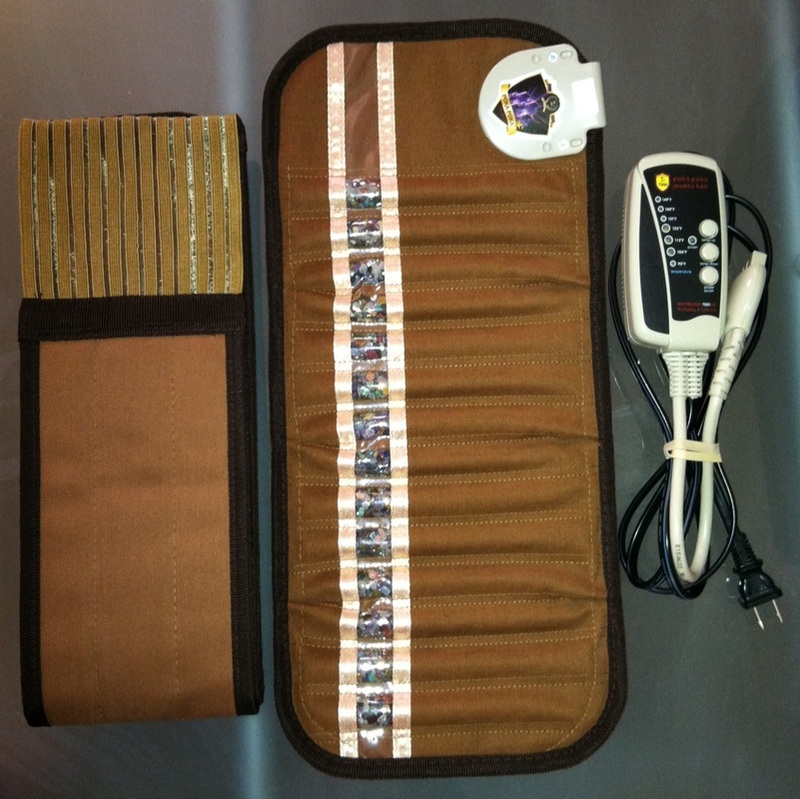 For additional information click here to visit the Infrared BioBelt website. To order, please give us a call! Or email us a good time to reach you. Power Cord: 6 feet. Plenty of room to move around with. MAX. TEMPERATURE: 149F°/65C° with thermostat controls & 1 hour timer built in the controller.